Can first-year master students reproduce the results of research papers after a few hours of training? Yes, they can! 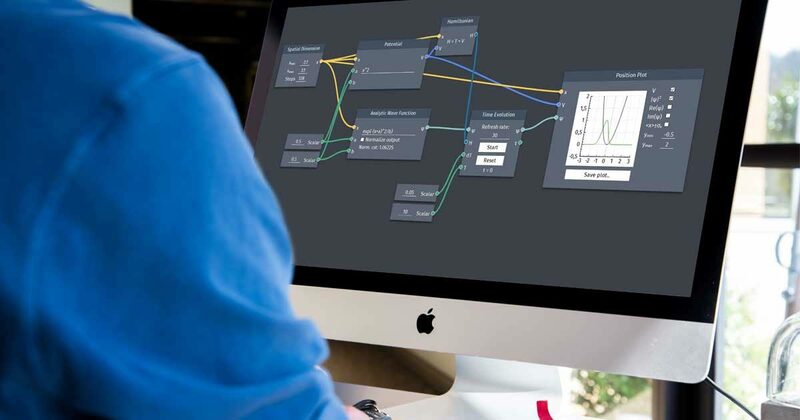 In a previous blog post we have written about the potential of Quantum Composer, a quantum mechanics simulation tool and the working team behind it. 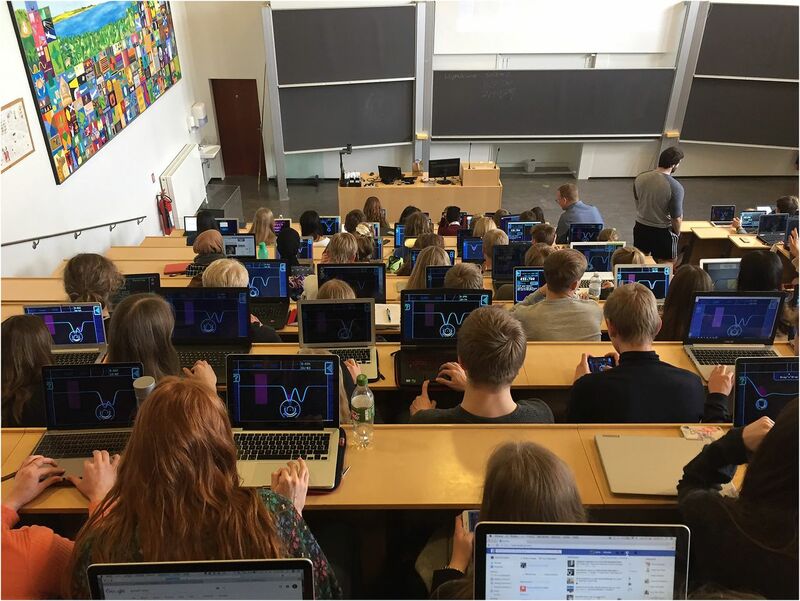 This time we report from a workshop where Quantum Composer was put into actual use in a university classroom setting and the students managed to reach far beyond their core curriculum with excitement and fun. Louise Kindt, the head of educational outreach at ScienceAtHome is busy with attending events across Denmark and informing both students and teachers about the benefits of using our games in the classroom and spare-time as well. This time she has visited Roskilde University and hold a four-hour workshop for first-year master students in their Quantum Mechanics course. The general approach in Denmark is that Physics students are introduced to quantum mechanics in their second year of bachelor level studies. Roskilde University takes an extraordinary approach by postponing it as an elective till the first year of master education. The didactics team prepared a learning trajectory for the students, tailored to their core curriculum, aiming to reach all those goals and take it even further. It may sound like an ambitious plan but with Quantum Composer and well-trained master students who are already used to gain knowledge quickly, it’s very much possible. "Quantum Composer is a numerical simulator of quantum mechanical systems which produce visual results. We believe it’s extremely powerful for students who are about to learn quantum mechanics. At the stage of learning linear algebra, they can use Composer as a support or even as a learning tool. It can be also a powerful tool for researchers who just quickly need to see how a quantum mechanical system looks like without having to prove descriptions about how to calculate them and do the math. Quantum Composer is the tool to win time and to replace some rather tough calculations." When students start learning quantum mechanics, they have to do a lot of linear algebra which takes a long time. It’s a long way to get through those rather boring calculations and by the time they finally put two lines underneath the results, they’re a bit tired. Even though that’s the real interesting point when they could start a conceptual discussion about a quantum mechanical system: what happens if they change some parameters? Quantum Composer is a powerful tool to remove all this math and enhance the learning experience, so students can spend more time and emphasis on concept discussion. For the workshop at Roskilde University, Louise and the didactics team prepared pre-initialized flow files for the students: already working sheets in Composer that the students were to download, observe and get an idea of how Composer works. The programming is based on nodes where each node is a mathematical action. The students only need to connect them right, add the right input parameters and then Quantum Composer provides an output. As a first step, the students observed the pre-made systems that they’ve already read about in their textbooks and compared it as a test of understanding and get a better feeling of how Composer can aid them. Taking it to the next level, they observed the Infinite World quantum mechanical system and then started a conceptual discussion about it: what happens if you widen or narrow it? They tried to investigate it which is essentially just changing parameters in Composer. By doing this, the students are already beyond their core curriculum after a few hours of training. Afterward, Louise guided the class towards the game Quantum Moves and made them think about it from a quantum mechanics point of view: How to transport a system and how to do tunneling? The students prepared flow files and started investigating those with different parameters. “This is already research, not a trivial assignment. Jacob Sherson associate professor published an article in 2011 where he and some colleagues did all the math and reached all these results that now students are capable to get with the help of Quantum Composer. I managed to make students reproducing those results after a few hours of Quantum Composer introduction.”—says Louise excitedly. Students found this approach more fun and entertaining compared to their regular learning methods but they are not sure if they would benefit spending more time with Quantum Composer because of their university requirements. Undoubtedly, university students need to fulfill many requirements within their education and also keep an eye on the job market for future opportunities and specialized areas. Though they might be able to learn quickly while feeding their curiosity using Quantum Composer, the use of this tool is not a requirement in their education and they won’t have it as a helpful tool at their exams. However, many of the students were still interested to play around with quantum mechanical systems at the weekend after their workshop. It’s definitely the most positive feedback for the creators that quantum expert students are eager to use Composer while getting a better understanding of quantum mechanical systems in an entertaining way. If you are a citizen scientist without formal science education background, find more information about Quantum Composer on the ScienceAtHome website. If you are a quantum mechanics expert, visit the Quatomic website to find out more about the potential of Quantum Composer and QEngine. Stay tuned for more stories about how our games can be used in a classroom!